Is Taylor Swift snubbing the ceremony? Can Jay-Z win album of the year? And where’s Beyonce? Here’s everything you need to know about the 60th annual Grammy Awards, which take place in New York on Sunday. The ceremony takes place on Sunday, 28 January. If you’re in the US, you can watch it live on CBS from 7:30pm (ET) / 4:30pm (PT). In the UK, you have to wait until 4Music screens a highlights show at 7pm on Monday night. However, you can watch red carpet coverage live on E! (151 on Sky, 156 on Virgin, 321 on BT) from 10:30pm on Sunday. And BBC Music News LIVE will be bringing you all the action as it happens, throughout the night. Bruno Mars and Cardi B – going back to the 90s. Elton John and Miley Cyrus – duetting on one of Elton’s classics. Lady Gaga – performing as a solo artist after her duet with Metallica last year. Patti LuPone and Ben Platt – billed as a “Broadway Tribute”, this will be a medley of songs from Evita and West Side Story. Pink – presumably on a trapeze. Rihanna, DJ Khaled and Bryson Tiller – who’ll play Wild Thoughts, despite losing out on a Grammy nomination. U2 – In a sign of the times, U2 are the only rock band in the line-up. And that’s not all… There are usually a few surprises on the night itself. Is Taylor giving side-eye to the Grammys committee? Gossip site Hits Daily Double recently claimed Taylor Swift, Ed Sheeran, Lorde and Justin Timberlake would SENSATIONALLY boycott the Grammys because they’re FURIOUS at being SNUBBED. In the past, artists like Frank Ocean, Justin Bieber and Kanye West have avoided the ceremony over a perceived racial bias; so a similar movement by white pop artists (some of whom have been accused of appropriating black culture) would be misguided at best. A more likely explanation is that the story is rubbish. While it’s true that several stars are missing from the seating plan, most of them have legitimate reasons for missing the ceremony. Justin Timberlake is busy rehearsing his Super Bowl half-time show, for example. And Taylor Swift’s latest record, Reputation, isn’t eligible for the awards until next year. As for chart-bothering pop megasaur Ed Sheeran? He’s only nominated in the pop categories, which are handed out in an earlier, non-televised ceremony. So he might as well stay at home and get a takeaway. On the other hand, Drake is actually boycotting the show. The Canadian star refused to submit his music for consideration after the Grammys relegated him to the rap categories last year. The Canadian star said he felt “alienated” by organisers “putting me in that category, cos it’s the only place you can figure out where to put me”. Absolutely. Halsey, Kelly Clarkson, Cyndi Lauper, Dua Lipa, Rita Ora and others plan to wear white roses to the ceremony to support the #TimesUp movement, which was launched in response to the sexual harassment scandals that have rocked the entertainment world. Pop star Kesha will also perform Praying – a song that addresses her relationship with producer Dr Luke, who she claims verbally, physically and sexually assaulted her (charges he denies). “We are going to do something a little bit different with it,” said Ken Ehrlich, who has overseen the Grammys ceremony since 1980. “I think people will come away with the sense that we are supporting or allowing the artist to make a statement,” he told Yahoo news. Who’ll win the big prizes? Sure, they look all friendly here – but the big battle for album of the year is between elder statesman of hip-hop Jay-Z and his younger competitor Kendrick Lamar. 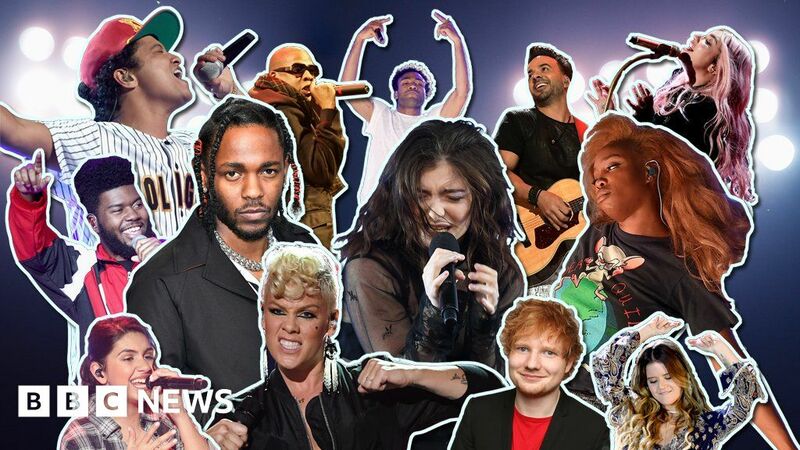 The smart money’s on Kendrick, whose incendiary, virtuoso album DAMN topped most critics’ lists last year – but there’s a danger Jay-Z will split the hip-hop vote, allowing Bruno Mars or Lorde to swoop in and steal the prize. Best new artist looks like a two-way tie between SZA and Khalid, whose confessional lyrics broached new ground; while Luis Fonsi’s Despacito could repeat its success at the Latin Grammys with a win for song of the year. There are 84 categories at the Grammys – including “best regional Mexican music album” and “best historical album” – so pretty much everyone gets a nod (except Katy Perry, who got zilch). In terms of volume, Jay Z has the most nominations – eight in total – followed by Kendrick Lamar and Bruno Mars, who have have seven and six respectively. Childish Gambino, Khalid, No ID and SZA have five apiece. You can see the main nominees on this page, or read the full, exhaustive list on the official Grammy website. The star, who’s the reigning queen of the Grammys, with 20 trophies to date, didn’t release anything during the eligibility period. But she does appear on Jay-Z’s track Family Feud, which is nominated for Best Rap/Sung Performance. Cardi B could become the first female rapper to win best rap song, if her massive US number one Bodak Yellow triumphs in that category. The late Carrie Fisher appears on the shortlist for best spoken word album; for the witty recording of her memoir, The Princess Diarist. There are also posthumous nominations for Leonard Cohen, Chris Cornell and Greg Allman. There’ll be a salute to Tom Petty, who died last October; while Gary Clark Jr will perform a set honouring rock pioneers Chuck Berry and Fats Domino. Meanwhile, country stars Maren Morris, Eric Church, and the Brothers Osborne will pay tribute to “the victims lost to gun violence and terrorism at various live music events over the course of the past year”. All three played at the Route 91 Harvest Festival in Las Vegas last October, where a gunman opened fire, killing 58 concert-goers. James Corden is back in charge of the Grammys after a well-received performance last year – including a spectacular fall down the stairs. “We’re just going to try and arrive with some little bits of fun,” he told CBS, “because most award shows, let’s be honest, are groups of millionaires giving each other statues. What’s the difference between song of the year and record of the year? Song of the year goes to the people who wrote the music and lyrics. Record of the year recognises everyone who contributed – singers, musicians, producers, janitors, receptionists, pizza delivery boys, people who sued to get their name added to the credits, Simon Cowell, pet dogs, Simon Cowell’s pet dogs, ex-boyfriends and estranged aunts (ft Migos). Who has won the most Grammys? In a single night, the record haul is eight awards. Michael Jackson did it first in 1984, followed by Santana in 2000. But conductor Georg Solti holds the overall record, with 31 wins between 1962 and 1997. Quincy Jones and Alison Krauss are tied for second place, with 27 trophies. Interestingly, Krauss could finally break that tie this year, as her album Windy City has earned two nominations: Country solo performance for the track Losing You and American roots performance for I Never Cared For You.